Nancy learned to sew using two presser feet—the all-purpose sewing foot and a zipper foot. Soon she discovered that specialty presser feet could improve her sewing skills. Much later she passed this information along in a series titled, Fancy Footworks. Not all sewing machine feet were featured in that series, so you guessed it—a sequel, Fancy Footworks 2. What could be called the high heels of sewing machine feet, the Flower Stitch Presser Foot is a fancy-occasion presser foot. It is an ideal creative option for mid-range sewing machines. Attach the Flower Stitch Foot to your machine, grab a fabric scrap and a piece of stabilizer, and start experimenting with different built-in utility stitches. No fancy embroidery machine needed here. Whether testing or sewing the actual project, always back the fabric with a fusible interfacing and also a stabilizer. Nancy used Pellon Sof-Shape Interfacing and a Tear-away Hydro-stick Stabilizer. To create the flower stitches, Nancy started with a basic zigzag stitch or satin stitch. When she found a design she liked, she wrote down her sewing machine settings and stitch number next to the flower stitchout. When watching the Sewing With Nancy TV show, you’ll see exactly how to use this presser foot. Our guess is that your testing sample will look a lot like Nancy’s! When it’s time to sew on your featured fabric, be sure to add the interfacing and stabilizer mentioned above. Two additional presser feet are featured in Fancy Footworks 2, Part Two. 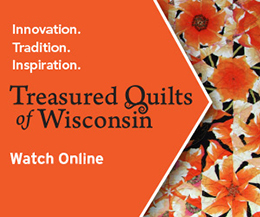 Tune in and see the Stitch-N-Ditch Foot—for easy work of quilt binding, and the Teflon Foot—ideal for hard-to-sew fabrics. 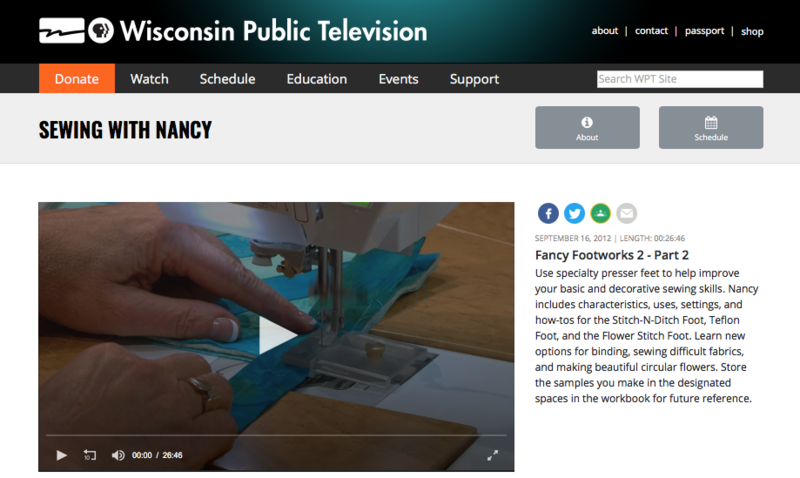 Watch Fancy Footworks 2 (Part One, Part Two and Part Three) on Sewing With Nancy online. Now that you are acquainted with these assorted presser feet, which one will you try first? Let us know in the comments for a chance to win the Ultimate Fancy Footworks book from Nancy’s Notions. A randomly selected winner will be announced on September 27. I am so afraid of when to use what foot! Having been a garment sewer since my early teens, I started Quilting about 12 years ago, but haven’t ventured into decorative stitching due to fear of the unknown. Would love to have the book and learn to use the different feet. It is amazing how a certain foot can make a sewing project easier. I have a few of these presser feet that came with my sewing machine, yet I have never used them. I would especially like to learn how to use the Stitch-n-Ditch foot. I would really benefit from having this book. Thank you for the opportunity to win! I think it would be fun to try the flower stitch foot on my next quilt project. It’d be a fun addition to the basic feet that came with my machine. Thanks for the chance to win Nancy’s wonderful book. Would love to try the flower presser foot. It looks like fun! 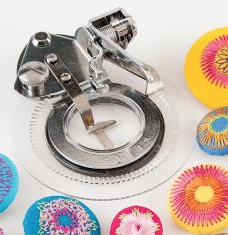 Just amazed by the creativity of the flower stitch presser foot and have never heard of it. Would love to learn more about it and the book would be a great aid. Can see pillows adorned with cheery flowers and even the hemline of a dress or skirt! I have the flower foot, but have never really done anything with it, so I’d love to work with that one! The flower foot is interesting but I personally don’t see a lot of uses for it by me. On the other hand, the stitch in the ditch foot I would use a lot more. Sew….I really could use the book! flowers would be fun to make and cute on a number of projects. Thank you! Love all of the feet that Nancy presented and need to learn how to use all of them. I didn’t even know some of these feet existed! I think I’d like to try the teflon foot first. Would love to try the flower stitch foot looks so cheery. I would love to learn how to do stitch in the ditch foot and use it for my quilting projects. I’d like to work with the flower foot since I’ve started embroidery work. Like Nancy, I also grew up with two presser feet. I have recently retired and have resumed sewing. Much to my dismay, I have found that many presser feet came with my new sewing machine. 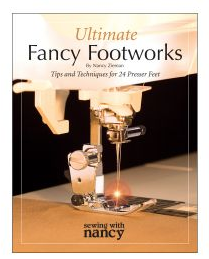 I would “sew” love to win Nancy’s “Fancy Footwork” book. I would love to play with my own ‘ Flower Stitch Presser Foot’. Watching ‘Sewing with Nancy’ videos always inspires me to learn about sewing. The flower foot looks very interesting, but I think I’d make better use of the stitch in the ditch foot. Either way, experimenting is fun. I have bought the flower stitch foot and still trying to perfect my stitching with it. I also have the stitch in the ditch foot but haven’t had the chance to try it yet. I think the stitch n ditch foot could be quite useful. I have not seen the flower foot, and I usually buy my feet from the dealer. I don’t know if they have the foot. It sure would be nice to make flowers faster by machine. Thank you . The Flower Foot is my next endeavor! I have one (I purchased it earlier) but haven’t used it yet. Now I’m ready! I have learned that using the proper presser foot for it’s specific purpose makes all the difference in the world! The flower stitch foot looks awesome. Would love to try that one. You should be able to search different episodes from there. As a beginner sewer I would love to try the flower stitch presser foot. Also would love to have the Fancy Footworks book so I can learn all about the different presser foots and try them all out. My new book today that Nancy’s husband Richarf, wrote on her and have already been reading it! What an amazing couple for sure. Would love to learn more about using different feet!! Thank you for the chance to win the book. I have never seen this attachment before. It made me think of my Grandmother who used to embroider by hand every night while watching her “shows”. I also have a new sewing machine, and am thinking about what feet I should add. I’d like to try the stitch in the ditch foot. It would simplify my application of binding not just for quilting but for other projects that require binding as well. That looks like so much fun. I’d love to try them on my grand daughter’s dresses that she loves for me to make for her. Is that foot only available thru a baby lock dealer? I did buy the flower stitch foot but have not yet worked with it. I think that I will get it out of the box and try it. I recently got a new sewing machine after 45 years. I’m excited to try some of these techniques with some interesting presser feet. I haven’t decided which ones to purchase but this book would give me great ideas. The flower stitch foot would make great flowers. Who doesn’t like flowers. I would also like to try the stitch in ditch foot to help with quilting. Thanks for the chance to win. I love the results using the flower stitch attachment. Having sewn all my life, I use many attachments for my antique yet Cadillac, sewing machine, but never tried this. How exciting to discover new opportunities to be even more creative! I would like to try all of them for different effects on my crafts sewing! Thanks again for more great ideas and Out- of-the-box thinking! The flower stitch foot is a new one to me. I would like to experiment with this foot. Thank you. I would love to try the flower stitch foot! How pretty are those flowers! Thank you! I have a flower foot and have experimented briefly. Perhaps I’ll have more success with Nancy’s wonderful tips. So glad to have these wonderful resources. Nancy’s ideas and work has always inspired me. Today I will set aside 2 hours and play/sew! All work and now sew would make a sad life. I’m anxious to try the flower stitch foot. I had never seen one before and think it would be fun to experiment with. I agree with Nancy’s blog that using different sewing feet can certainly enhance your sewing skills. I would love to learn how to use the ruffler foot. Whenever I do any gathering, I am aware I have this foot but am too intimidated to try it. I think this book would certainly improve my sewing abilities potential and make my sewing time even more enjoyable. I was just looking at my quilting feet. I have a project that needs to use the flower foot. Would love to e book. 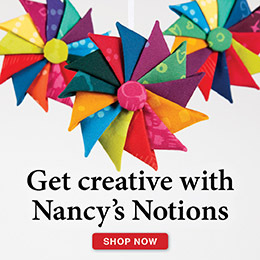 I actually bought a flower foot from Nancy’s Notions last year but have been hesitant to use it. I have twin granddaughters who would love it if I made them clothes and accessories with flowers. What a great invention! I would start with using it on my plain pillowcases and have the flowers match my bedspread. Then I would use it to make flowers on my towels. I’ve been intrigued by that flower stitch foot since the first time I saw it in your catalog, but was afraid it wouldn’t fit my machine. That’s what I would like to try first. The flower foot sounds just like the perfect foot to try out first. My garden at home is filled with flowers year round, and I would love to bring some of those flowers inside my home as well. Thanks. Looks like fun – and so much cheaper than an embroidery machine. I’ve not seen the flower foot before. Does it come in high and low shank? I would like the flower stitch foot to play with. It is next up on my want list. My soon to be daughter-in-law wants to learn how to quilt. She purchased her quilting grandmother’s sewing machine from the estate. My thought is to go through all the stitches and feet with her and I will do the same on my machine. Hopefully she will learn how to sew and I will have a better understanding of what my machine will do. The flower foot is new to me and sounds like a great one to try. Flowers always brighten my day! I would start experimenting with the flower stitch foot because I like flowers..
Just bought a new sewing machine. This would be a great workbook lesson to learn how to use all of the feet.